Regency Energy has been busy. The company announced two expansions to ongoing pipeline projects serving the Haynesville Shale. The first is the addition of 17 miles of 20” pipe along with compression and dehydration facilities to the company’s Nexus Gathering System. The project, called the Logansport Expansion, will serve wells in DeSoto Parish, LA and Shelby Co., TX and will interconnect with CenterPoint Energy Gas Transmission’s Line CP. The second project is an expansion of the Regency Interstate Gas Line (“RIGS”) project that is still under construction. The expansion, called the Red River Lateral, will extend the reach of the new pipeline 12.5 miles (36” pipe) into the western portion of Red River Parish, currently a hotbed for big fat wells. The slide below does not show the Red River Lateral, but you can see where it will come from. I’ll post a drawing of the extension when I find one. 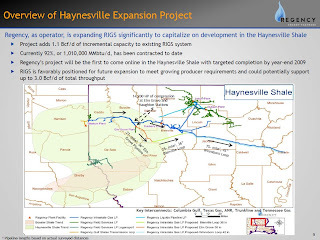 The RIGS Haynesville Expansion project, which pairs Regency with private equity investment partners, is expected to be in service, including the Red River Lateral, at the end of 2009.